We are working with top global reinsurance and financial companies. What technologies your company is working with? 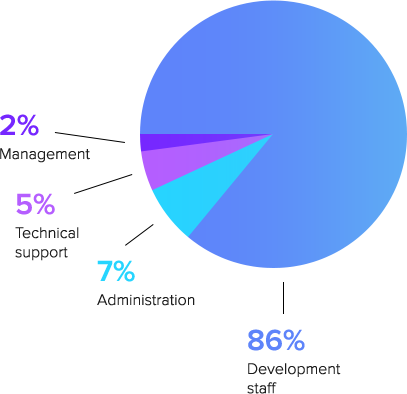 How many developers are working in your company? At the moment we have 370 employees. What happens with the team when the project is finished? Employees are reassigned to other projects within company. What are educational possibilities in your company? Our employees have wide range of opportunities for professional development such as: attending trainings, certifications, local and abroad conferences. Moreover we have great library within the company and our employees can order any IT-related book they want. How can I get a raise? We have an Employee Performance Review (EPR) conducted twice a year, where the employee is evaluated by what was done and are setting the goals for the future. EPR results influences the career growth. What is the working time? We have standard (8 hour) working day. Usually it is 9am until 6pm however it can be discussed with your direct manager. Do you have strict dress-code? Our company has no strict rules regarding clothing style. What additional bonuses do you have? We have advanced medical/healthcare insurance, regular doctor’s visits to the office (check-ups, prescriptions, consulting), regular teambuilding events, participation fee sponsorship of active outdoor events and many more. Does your company cover mobile phone expenses? Yes. Company provides a new mobile phone number (or you can register your existing number to a company name) and the compensation quota depends on the employee’s position/role/functions.